Combine farro and 6 cups of water in a medium pot. Bring it a boil, reduce heat, cover and simmer for about 25 minutes, until soft. If there is still water, drain it off like you would pasta. While farro is cooking, you can prep/grill the chicken and vegetables: Brush chicken breasts with olive oil and season with salt and pepper. Toss zucchini and summer squash with 2 tablespoons of pesto. Heat grill to medium-high heat. Place chicken breasts and zucchini/squash on grill. Cook zucchini and summer squash 2-3 minutes on each side. Cook chicken until cooked through, about 5-6 minutes on each side. I always use a meat thermometer to ensure I don’t over or undercook my meat. 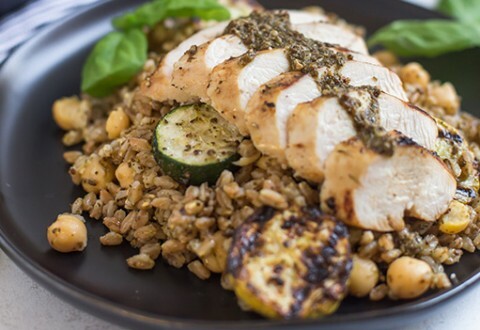 Chicken should be cooked to 165 F. In a large bowl add farro and chickpeas. Add remaining pesto and toss to combine. Add zucchini, summer squash and chicken and gently toss. Serve and enjoy! * Recipes created for given quantity. Changes to quantities are for planning purposes only and have not been tested.